Generally, Solar Heating is any solar thermal method that has a heating temperature between 80℃ and 320℃. 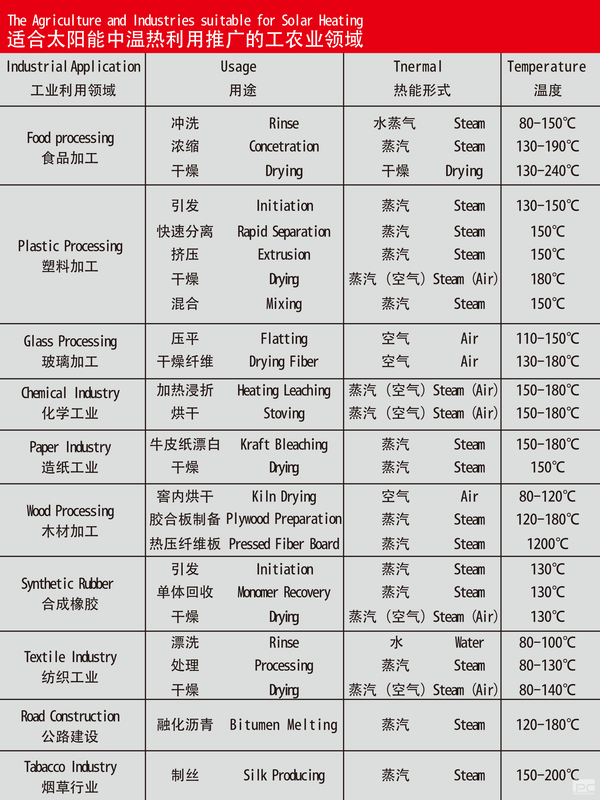 It is widely used in any occasion in life and production that requires producing hot oil or steam, such as heating, air conditioning, textile, printing and dyeing, papermaking, rubber production, seawater desalination. Taking textile as an example, it is water or steam with the temperature between 80℃ and 140℃ is needed in the processes of rinsing, handling and drying, and produced by burning a large amount of coal or natural gas or crude oil in traditional heating ways, in which huge quantities of non-renewable resources are exhausted. Comparing with any traditional energy, Concentrating Solar systems are clean, eco-friendly and pollution-free, and could be applied in any production that requires producing hot oil or steam, in which Parabolic Trough is mainly used. Since the power consumption of domestic heavy industry ﬂies high, and crude oil and power shortage spreads around, the solar thermal application of industry becomes top priority in the 12th ﬁve-year-plan energy saving. In 'Guiding Catalogue of Industrial Structure Adjustment (2011 version)', which was published by the National Development and Reform Commission on April 25th, 2011 and was enforced on June 1st, 2011, Solar Heating was listed as encouraged new energy project. As the progress of Solar Heating technologies, instead of household water heating, industry application becomes the future of solar thermal application. The Agriculture and Industries suitable for Solar Heating are listed in table below. Take a new solar boiler for example, cold water is heated to 95℃ by solar energy, then is heated to 150℃ steam in the boiler to be used in production. Parabolic Trough is also applied to directly produce high temperature and pressure steam to meet the demand of industrial thermal application by heat exchanging between a working ﬂuid and water. Moreover, with a combination of thermal storage and common industrial boilers, continuous and steady steam, which meets industrial demand, can be produced.